The view from the steple of Sta Euphemia church in Rovinj. When we received an invitation to a friend’s wedding in Croatia, we initially felt excited but also a little confused. We had agreed that we would not be taking any trips for a while in an effort to save up for our long-term travels, which at the time were still in their planning stages. 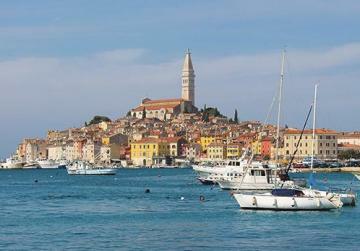 The town of Rovinj on the Istrian peninsula. But Croatia sounded tempting, and after convincing ourselves that our absence from our friend’s special day would be a rude gesture (a decision that in all took about three seconds), we searched for flights for a three-day weekend break in Split, Croatia, where we hoped to not only experience a traditional Croatian wedding, but also to explore the history and heritage of Split. 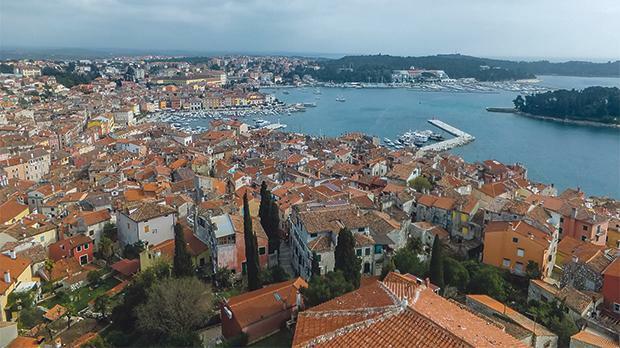 The more we read about Croatia, the more enticing it sounded, and our three-day city break quickly developed into a much longer road trip around the Balkans, through Croatia, Montenegro, Albania, Mace­donia, Kosovo and Bosnia. We figured that long-term or otherwise, this adventure would still contribute to our travel experiences, and now that we are currently travelling for 15 months in Asia, we are very glad to have taken up the opportunity to explore a large chunk of eastern Europe just before we left the continent. Croatia is as spectacular as it is diverse, but has the reputation of being overcrowded. This is especially so in the summer months, when many tourists flock to its shores to enjoy its beaches and sailing opportunities. We visited during the shoulder season, which we found to be surprisingly quiet considering we had good weather most days and prices had not yet been hiked up. We landed in Split on a Saturday night, after having connected through Rome. We quickly discovered that the heart and soul of the Adriatic port city is in its vivacious and buzzing medieval walled town. Split is an eclectic mix of modern and old where the underground cellars of an ancient Roman palace are used to house modern shops, designer boutiques line the ancient roads in the town core, while little bars and restaurants hide away in the palace ruins. The next day, we rented a medium-sized car from a local agent (quiet the bargain!) and drove off to discover the rest of Croatia, knowing that we would be returning to enjoy more of Split on our return leg. After having explored most of Croatia, both coastal and inland, we agreed that the northwestern region of Istria was our favourite spot. 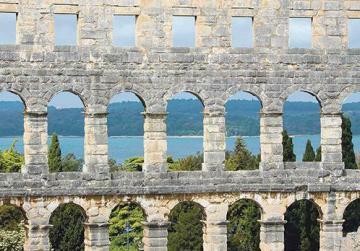 Often compared to Tuscany in Italy, Istria is less popular but not less beautiful. 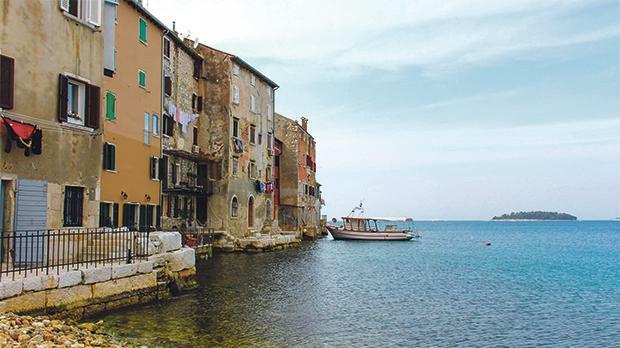 The heart-shaped peninsula, where Italian is widely spoken, feels very different to the rest of Croatia, with its olive groves and little fishing villages highlighting the Mediterranean character of this part of the country. Our first stop in Istria was the glamorous Opatija, a former summer retreat for the elite during the Austro-Hungarian era. With its magnificent heritage hotels and villas, Opatija, is an elegant resort town with manicured gardens and a long coastal promenade overlooking a pretty stretch of beach. The Maiden and Seagull statue, symbol of Opatija. 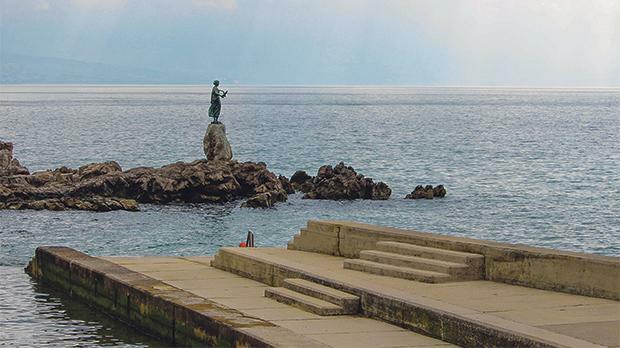 A statue of note is the Maiden with the Seagull, nowadays considered to be the symbol of Opatija, easily visible when taking a walk along the promenade. Angiolina Park, a charming horticultural monument, not only contains several species of exotic plants, but is also a pleasant place for a stroll, especially around its open-air theatre, which contains murals of famous people who either lived or visited Opatija in the past. We decided to have dinner in Volosko, a few minutes’ drive away from Opatija, a quaint little fishing village with steep narrow roads and stairways. Several cafes and restaurants in the village cater to tourists and locals alike, providing delicious fare made from home-grown produce and locally sourced ingredients. Home-made pasta garnished with fresh toppings such as shrimp and ripe cherry tomatoes, local truffle, cured meats, squid ink risotto, hearty potato gnocchi, freshly-caught fish and local olive oil are staples in many of Istria’s restaurants, and it is not surprising that the region is fast developing into a top-notch gourmet destination for food lovers from all over the world. And with more than a hundred wineries spread over Istria’s interior, wine lovers are spoilt for choice! 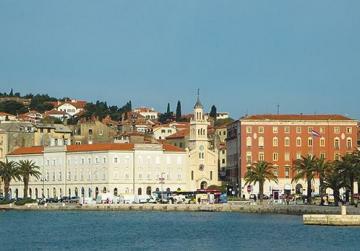 Pula, our next stop, is situated right at the tip of the Istrian peninsula. Home to many historical sights and once the Austro-Hungarian Empire’s chief naval base, the main attraction here is a well-preserved Roman amphitheatre nowadays used to host concerts and festivals in summer. It is the sixth largest surviving Roman amphi­thea­tre in the world, with space for 22,000 spectators, and is well-known for being the only existing amphitheratre to have an almost intact external shell. Other noteworthy historical attractions include the Temple of Augustus, a Roman Forum, the Triumphal Arch of the Sergii and Hercules Gate. While we enjoyed visiting the sights we found Pula’s charm to lie in its vibrant, urban­ised feel, as opposed to the quiet, laid-back vibes typical of the other little villages lining Istria’s coast. Approaching the very picturesque Rovinj, one might be forgiven in thinking that the fishing village is located on an island rather than on its own little peninsula on the western coast of Istria. Almost fully surrounded by water, the village’s most imposing structure is the bell tower of the church of St Euphemia, which stands on a hilltop at the centre of the village. Cobbled roads with little alleys and corners hiding little cafes and olive oil shops lead right up to the hilltop. Colourful houses line the steep lanes and byroads, while Rovinj’s feline popu­lation roam the alleyways in search of titbits left by passers-by. The Roman Amphitheatre at Pula. We arrived in Rovinj early afternoon when restaurants by the water’s edge, were full of tourists devouring large portions of fried anchovies and grilled calamari, noticing that quite a few were nodding off after enjoying a glass or two of local wine under the Istrian sun! After a simple lunch of fish and potatoes, topped off by creamy local gelato and complimentary shots of rakija (the local liqueur) we set off to climb up to the church and steeple. As we creaked our way up the narrow wooden staircase, strategically dodging the pigeon droppings showering down on our heads, we hoped that the view from the top of the tower would fulfil our expectations. It was really windy at the top, but the spectacular panoramas over the town were indeed well-worth the effort and the pigeon poop! Istria is not just about coastal towns – inland Istria is home to some pretty rural villages perched atop grassy hillsides surrounded by vineyards, fields and olive groves. There’s no doubt that upon our return to Europe, the Istrian peninsula is one of the regions that we will give more attention to during our future travels, especially considering that its high-quality, inexpensive local cuisine, mild climate and laid-back character make it one of our favourite destinations in Europe. Nikki Vella and Michelle Zammit are a couple from Malta struck by wanderlust and curiosity. A pharmacist and a mechanical engineer, they have travelled to over 60 countries in five continents and have recently traded their full-time jobs for an indefinite trip around the world. You can follow their adventures on their travel blog www.cheekypassports.com or through your favourite social media platform.